Measles is a highly infectious disease that is easily spread through air-borne droplets. Measles can have serious complications. Everyone born during or after 1966 should be vaccinated against measles. Measles is one of the most easily spread of all human infections. Just being in the same room as someone with measles can result in transmission of infection. It can also be spread through direct contact with the mucous membranes of an infected person, and by touching articles freshly soiled with the mucous and saliva of an infected person. In the past, measles infection was very common in childhood. Now, due to immunisation, measles infection is rare in Australia, however it remains a common disease outside Australia and outbreaks can occur when overseas travellers bring the virus back to Australia with them. Measles is a different disease to German measles. How do you get measles? Measles is usually spread when a person breathes in the measles virus that has been coughed or sneezed into the air by an infectious person. People with measles are usually infectious from just before the symptoms begin (2 to 4 days) until 4 days after the rash appears. The measles virus has a short survival time in the air and on objects and surfaces (less than 2 hours) and it is inactivated quickly by sunlight and heat. It's generally considered safe to enter an area where a person with measles has been (e.g. a clinic waiting area) 30 minutes after they have left the area. If you have never had measles or have not been vaccinated against measles you are at risk of measles infection. If it is less than 3 days since you came into contact with a person with measles, immunisation can prevent you becoming infected. If it is more than 3 days and less than 7 days since you came into contact with a person infected with measles, an injection called immunoglobulin can protect you. Immunoglobulin contains antibodies against the measles virus. It is especially recommended for young children (less than 1), pregnant women who have not been immunised and people with other medical conditions who have a greater risk of developing complications if they catch measles. The time from exposure to becoming sick is usually about 10 days. The rash usually appears around 14 days after exposure. These symptoms usually last for a few days before a red blotchy rash appears. The rash starts on the face for 1 to 2 days and spreads down to the body. The rash will last for 4 to 7 days. Up to one-third of people infected with measles will experience a complication. This can include ear infections, diarrhoea and pneumonia, and may require hospitalisation. About 1 in every 1000 people with measles develops encephalitis (swelling of the brain). How do I know I have measles? Measles can be difficult to diagnose early in the illness because there are many other viruses that cause similar illnesses with fever and a rash. Sometimes the presence of white spots inside the mouth, called Koplik spots, the timing of the fever and the rash, and the appearance of the rash can help a doctor to make the diagnosis. Whenever measles is suspected, a blood test or a swab can be taken from the nose or throat and a urine sample can be collected to confirm the diagnosis in the laboratory. Confirming the diagnosis is important so that other people who may be at risk of measles can be identified and offered vaccination if they have not been already vaccinated. Caution: When making your doctor’s appointment, tell the staff that you may be infectious. You will need to wait in a separate area from others, especially young children. Measles is a notifiable disease so doctors, hospitals and laboratories must inform the Department of Health of you or your child’s diagnosis. Notification is confidential. Department of Health staff will talk to you or your doctor to find out how the infection occurred, identify other people at risk of infection, and let you know about immunisation and whether you or your child needs to stay away from work, school or group gatherings. There is no specific treatment for measles. You should rest, drink plenty of fluids, and take paracetamol for fever if required. While you are infectious with measles, up to 4 days after the rash appears, it is important that you stay at home to avoid spreading it to other people. 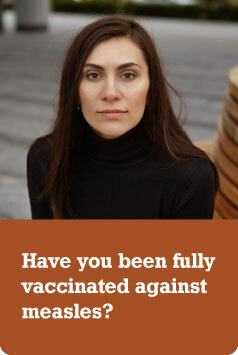 Is there a vaccine against measles? Yes, the measles, mumps and rubella (MMR vaccine) is available. Unimmunised children who have come into contact with measles and who do not receive MMR or immunoglobulin cannot attend school until 14 days after the rash appeared in the person with measles. Measles is a serious and highly contagious disease. Vaccination has now made measles quite rare in Australia. View and download this information as a PDF factsheet (299KB).